When preparing to install flooring in your home and you want a wood floor, you should seriously consider installing laminate flooring rather than hardwood. If you conduct research into these different types of flooring, you will surely come to realize all of the advantages that laminate flooring has to offer, far surpassing those of hardwood floors. One such advantage of laminate flooring is the price. Laminate flooring is typically around 25% less expensive than hardwood flooring, which means, in essence, that you can install a floor with the sleek look of hardwood but at a fraction of the cost. Another advantage of laminate flooring is how easy the installation is; in fact, much more so than is the case with hardwood flooring. Laminate flooring now comes in glueless planks that have an interlocking groove and tongue design, making it incredibly easy to install this type of flooring as you simply click the planks together. Installation of a hardwood flooring would require the use of glue or nails, which makes for a much more difficult effort. Because the installation of laminate flooring does not require the use of glue or nails, it ends up being a much less messy endeavor as well. You also don’t have to wait for any glue or other adhesive to dry, so you can use your new laminate flooring right away. Because laminate flooring is so easy to install, it also takes much less time than hardwood floor installation. The efficiency associated with installing laminate flooring is for two reasons: first, and as mentioned above, this type of flooring is very easy to install; second, this type of flooring comes in wider planks than hardwood, so you cover more surface area more quickly. 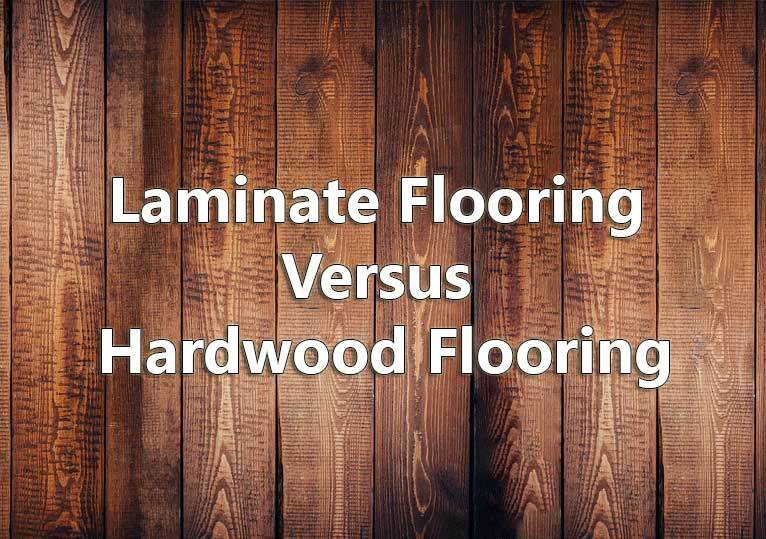 Yet another advantage to installing laminate flooring is its durability, which far surpasses that of hardwood flooring. Laminate flooring can certainly take more a licking and keep on ticking, while hardwood floors can be damaged quite easily. As such, laminate flooring is perfect in areas with heavy foot traffic, and will often come with a much longer warranty (typically around ten to fifteen years, unlike the shorter warranties which tend to come with hardwood flooring). If you opt for laminate flooring, you are getting a floor that is approximately fifteen times stronger than hardwood flooring. Something you do not often think about when it comes to floors is UV protection. Well, that is exactly what laminate flooring has. This type of flooring can block the UV rays emitted by the sun, thereby protecting the floor from fading. With hardwood flooring, you must incur additional maintenance costs to keep up its original look since hardwood flooring does not come with any sort of protection from the sun’s rays. Finally, laminate flooring comes in many different designs and patterns, giving the consumer a world of options from which to choose. Basically, there are four layers to laminate flooring, with one of the layers being the “design layer”. The design layer consists of a photographic image, which is what provides the natural wood look, knots, grain and all. how to select canister vacuum for cleaning hardwood floors? Due to this photographic image capability, laminate flooring can come in many different options with many different looks. Hardwood flooring does not have as much variety because it cannot be manipulated in this same way. Maintenance of your laminate flooring is a breeze. You simply need to wipe it clean with a brush or dust mop. When it gets wet, just dry it with a paper towel, mop, or sponge.